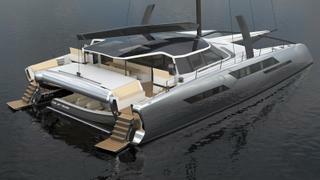 North Carolina carbon fibre yacht specialist Daedalus Yachts has revealed new details on its 24 metre eco-catamaran. Powered entirely by energy captured from the wind, water and sun, the first D80 is scheduled to launch in November this year. The D80 will feature a master cabin forward, helm positions on deck and inside the saloon and accommodation for 13 guests. Various layouts are available to accommodate more or fewer cabins. Daedalus is spearheaded by Michael Reardon, a 35-year veteran of yacht building, and Swiss tech entrepreneur Stefan Muff, who created the technology that became the basis for Google Maps. They met when Reardon was the chief designer at performance sailboat builder Gunboat and the first D80 hybrid is being built for Muff and his family. The yacht will use technology that is also being employed in two larger catamaran designs, a 29 metre and 43 metre, developed by the company. This will see the yacht powered by the most fossil free technology available – hydrogen, lithium batteries sourced from BMW as well as wind and solar energy. Carbon turbines will capture the wind and convert it into energy while Solar Cloth, a flexible photovoltaic textile used for the catamaran’s trampoline and sails, and 35 square metres of solar panels will convert the sun’s rays. The hydrogen meanwhile is made from the sea water by the on board water maker while the overall propulsion system is able to store excess energy for later use. Helping with performance is propriety technology, including semi-C shaped foils that will generate 20 per cent lift, equating to an eight-ton reduction in displacement. The D80 is designed to sail 1.4 to 1.7 times the speed of true wind speed.